This is an ideal security stand solution for display, point of sale or personal use. The slim but strong case is designed to fit the iPad Pro 9.7, iPad Air (1-2), or iPad (2017) with convenient access to all ports and buttons. Your tablet easily slides in and can be safely kept inside the protective case and locked to a secure object using the included cable lock and keys. 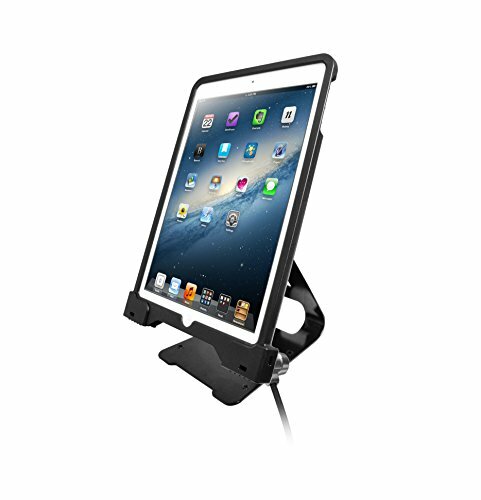 The case can tilt 180 Degree to easily adjust the viewing angle and rotate for horizontal or vertical views. A solid metal stand offers stability and can be secured to a desk or countertop through predrilled holes for easy installation and extra security.